WHAT time are you reading this? At 9.10am this very day 100 years ago, hundreds of Durham men slithered up out of their rain-lashed trenches on the Somme and tried to wade through waist-deep sticky mud to attack a heavily fortified mound. Within 24 hours, the DLI lost more than 1,000 men – 273 of whom were killed. The rest were wounded, missing or captured. And they gained nothing. They were beaten back in the trenches where they started. The full story of the attack on the Butte de Warlencourt – a prehistoric burial mound which had an emotional hold over the surrounding countryside in the way that Roseberry Topping has a mystical presence over the Tees Valley – is told in the special Remembrance Sunday edition of the paper which is on sale from November 6 – 13, 2016. Three DLI battalions were thrown against the mound: the 6th, which was raised at Bishop Auckland; the 8th, which comprised many pitmen from Durham City and the north of the county; and the 9th, which had been raised at Gateshead and was commanded by Lt Col Roland Bradford. Bradford, who was born in Witton Park and grew up in Darlington, did not know on the day that he was in the process of receiving the Victoria Cross for his bravery in battle a couple of weeks earlier. Among the 273 Durhams who died a centenary ago was Cpl Robert Pitt of the 8DLI. He was a pitman from Annfield Plain, who’d signed up as a territorial in 1909. When he went to war in late 1914, he left his wife, Mary, with their two-year-old son, Robert, at home in New Kyo. He was hospitalised for 59 days with gunshot wounds sustained on June 15, 1915, in Sanctuary Wood, near Hooge, five miles from Ypres. It may be just coincidence, but at this time at Hooge there was an underground battle as the British and Germans tunnelled beneath each others’ trenches to explode mines – a pitman would have been useful in such dark places. After Hooge, Robert was patched up and promoted. He returned to the trenches, this time on the Somme, where he was killed on November 5, 1916, fighting for the Butte. He was only 25. 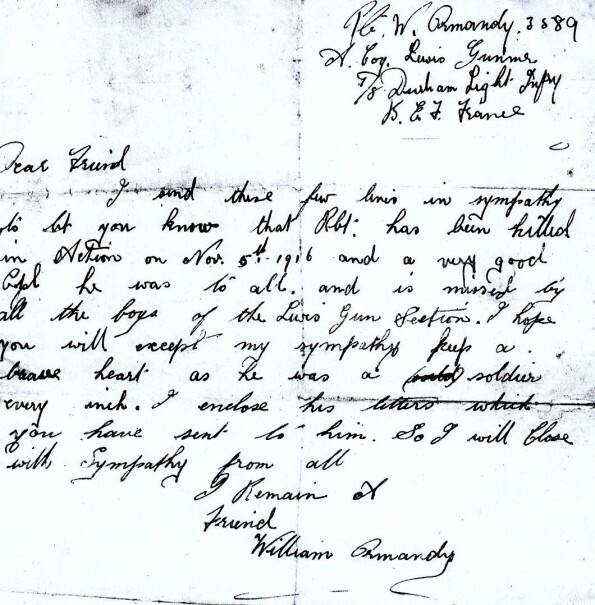 Mary, back home in New Kyo, learned of his death in a handwritten letter from Pte William Ormandy of the 8DLI. “I send these few lines in sympathy to let you know that Rbt. has been killed,” he began. “A very good Cpl he was to all, and is missed by all the boys of the Lewis Gun Section. It must have been devastating news for Mary, who hailed from Middlesbrough. 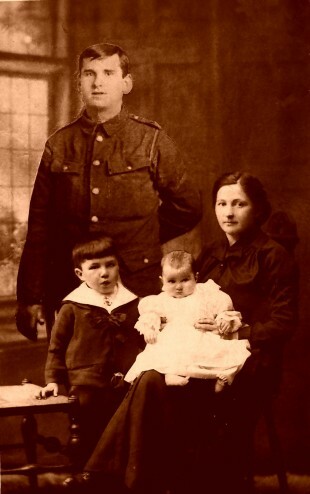 It came just two months after her 19-year-old brother, Pte Peter Murphy of the Yorkshire Regiment, had been killed on the Somme, and it found her looking after four-year-old Robert while she was eight months pregnant. When the baby girl was born, she named her Sommena after the battlefield on which the father she never met was killed. “My Aunt Sommena was always proud of her name,” says Mary Pitt, Robert’s grand-daughter who lives in Stanley. Last year, Mary took part in a Workers’ Educational Association (WEA) research project, which was supported by the Heritage Lottery Fund. It included a visit to the Somme where, on the 99th anniversary of his death, she found her grandfather buried in Warlencourt Cemetery, just a few hundred yards from the mound he had died trying to capture. ALSO on the WEA trip last November to the Somme was Bill Lawrence, the former Darlington council health and safety officer who has spent a lifetime working on asbestos related illnesses. As he was leaving Warlencourt cemetery, Bill noticed a headstone commemorating Pte Thomas Tortoise of the DLI who had also died on November 5, 1916, in the unsuccessful attack on the Butte. Bill’s interest was piqued – could Pte Tortoise have been the slowest marcher in the DLI; could Pte Tortoise have come under shellfire? – and he set out to find out more. The surname Tortoise is, of course, highly unusual. Some sources say it is a corruption of the more common British surname Tattershall (sometimes pronounced “tatter-shell” as in “tortoiseshell”); other sources say it is an Anglicisation of a French surname, Tortesse. Only two Tortoises died in the First World War: Thomas and his brother, Bertie, who was killed in northern France on October 13, 1915. Bertie was in the Norfolk Regiment – and, indeed, most people with the surname Tortoise live in Norfolk. So how did a Tortoise end up in the Durhams? Bill’s research suggests that Tommy was rather a naughty Tortoise. He grew up in Norwich, and spent some time in the workhouse. 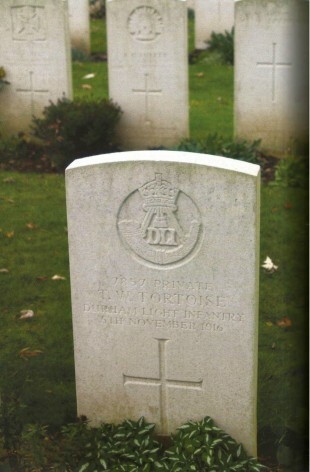 He joined the Norfolk Regiment on August 16, 1915, and gave his age as 19 – “doubtful” wrote the recruiting officer beside it, but then another hand wrote: “Father confirms age correct.” Mr Tortoise Snr could neither read nor write, but Tommy was in – even though he was at least two years younger than 19. Initially, the young man wasn’t a good soldier. On June 29, 1916, he was court martialled for disobedience and wilfully ignoring authority, and sentenced to 60 days detention. Immediately his detention was over, he was transferred from the Norfolks to the Durhams, and sent to join them on the Somme. Presumably the change of regiment was meant to be a fresh start, but, unfortunately, on the way to the front, Tommy transgressed once more, and at Etaples he was fined seven days’ pay for “reporting sick without a cause”. He made it to the front on October 18, and was killed at the Butte on November 5. The poor lad’s age isn’t recorded on the Commonwealth War Graves Commission’s website, but after a troubled start in the workhouse, after being signed away by his illiterate father, and after going sick rather than face being slaughtered, the lad Tortoise had crammed a lot into his short 18 years.